to a T1 network in the 1.544 Mbps T1 transmission network. 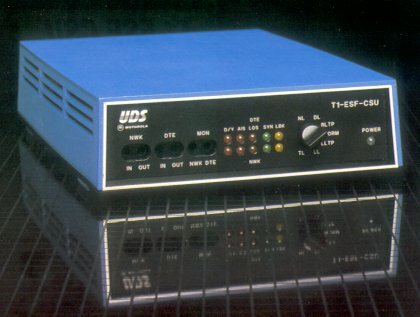 The UDS Motorola T1-ESF CSU, Extended SuperFrame Channel Service Unit, links your T1 DTE components (T1 multiplexers, channel banks, digital crossconnect equipment, and PBXs with T1 interface) to the 1.544 Mbps T1 transmission network. The T1-ESF CSU extended superframe is a T1 framing technique that provides a method of error checking. The T1-ESF CSU is compatible with both SF (D4) and ESF T1 framing modes and is capable of framing mode conversion. This feature allows your older, non-ESF capable equipment to operate on ESF T1 lines with the T1-ESF CSU performing the transcoding. External Configuration and Performance Monitoring All CSU options can be selected through the 9-pin EIA-232 control port interface and stored in nonvolatile memory. Also, network line performance data is measured and accumulated by the T1-ESF CSU. An "error history" log in 15 minute increments is maintained for the previous 24 hours and can be accessed from the control port or the network central office. Network Management Features - Up to 15 T1-ESF CSU's installed in the Universal Data Shelf can be controlled by a single terminal -and multiple shelves can be linked to form a larger network under single terminal control. Network Line Build-Out - The T1-ESF CSU provides a choice of 0, 7.5, or 15 dB Network Line Build-Out options. Line Equalizer A DTE line equalizer allows up to a 655 foot cable length between the DTE and CSU. Keep Alive A "keep alive" feature transmits an unframed all ones AIS toward the network on loss of signal from the DTE. Pulse Density Maintenance Network transmit signal pulse density is maintained by "pulse stuffing" or B8ZS (bipolar with 8-zero substitution). Alarm Outputs Provides external alarm indication outputs. The T1-ESF CSU provides a complete set of integral loopback test features for fault isolation on the T1 network.